Every visitor to Rome should visit the Vatican Museum at least once. It’s a “must do.” The displays are fabulous; the history on display is phenomenal. The crowds are epic. The normal visitor will stand in line for quite a while and then join the parade of thousands, an enormous mass of humanity oozing through the famous hallways and past the displayed great masterpieces. By far the easiest way to get in (bypassing most the lines) is to join one of the many organized tour groups. That’s what we did. The famous spiral staircase has to be one of the most photographed subjects in the Vatican — a place with literally miles of ornate hallways filled with great works of art. Giuseppe Momo was commissioned to build the staircase in 1932. The resulting “Momo staircase” is actually two staircases — one for going up, the other down. When I lasted visited (decades ago), all visitors to the museum came in and out via that staircase. A lot has changed since then. With the enormous crowds today, a new visitor center (including security) has been built; most visitors enter and exit through those new facilities. Nowadays, the “up” half of the spiral staircase is almost never used by visitors. Most tour groups exit this way, but many individual visitors today miss the spiral staircase entirely. There are few opportunities to find an innovative angle or “different” take on such a well-photographed subject — the space is just large enough for the staircase itself, and by this point most tour groups have begun to resemble a forced march. But I had to try. This entry was posted on Sunday, March 25th, 2012 at 11:31 am. 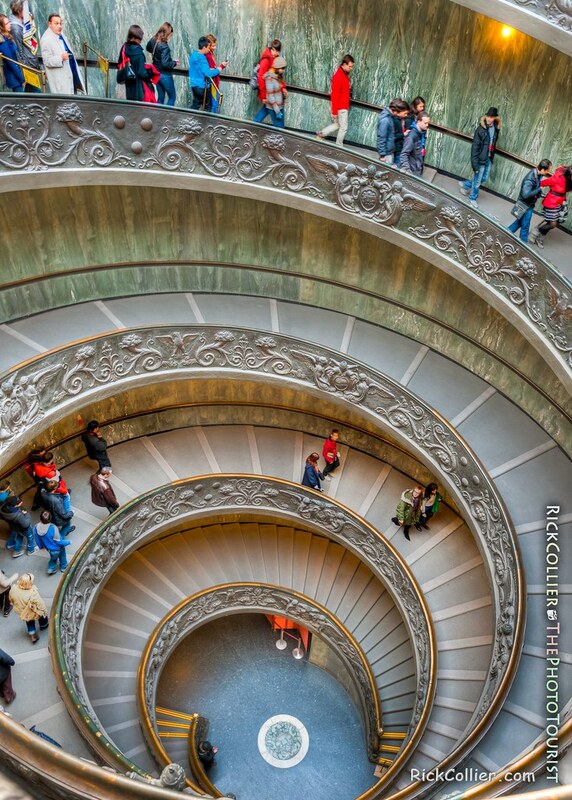 It is filed under thePhotoTourist and tagged with circular, circular stairs, Giuseppe Momo, HDR, helix, Italy, Land & Air, Momo, Momo Staircase, photo, Photo Tourist, PhotoTourist, Rome, spiral, spiral staircase, the Photo Tourist, thePhotoTourist, tour, tour group, tourism, tourist, Vatican, Vatican City, Vatican Museum. You can follow any responses to this entry through the RSS 2.0 feed.